Cell division requires careful bookkeeping. When they divide, our cells need to ensure that each daughter cell gets one copy of each chromosome. Bacteria face a similar, albeit simpler, problem. They contain a big circle of DNA, so they start replication one place, then copy the DNA both ways around the circle until it finishes on the other side. So, the challenge is to initiate replication at this origin only once for each generation of the cell. Researchers at the PSI JCSG have obtained the first atomic look at how bacteria use the Hda protein to solve this challenge. 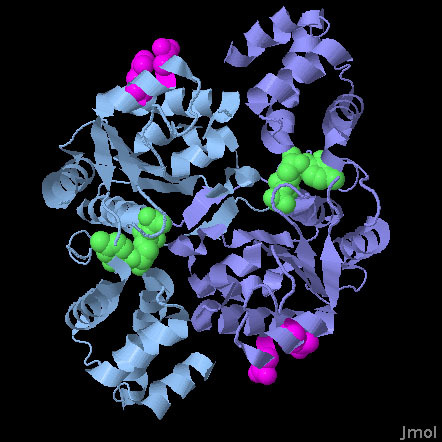 The story starts with the DnaA protein, shown here from PDB entry 2hcb, which gets replication started in the right place. It binds to a special origin of replication on the DNA and forms a large helical assembly with the DNA wrapped around the outside. With the help of a few DNA-bending proteins, this is enough to disrupt the DNA double helix in a special region that is rich in AT base pairs. When this region unwinds, the DNA replication machinery binds and gets to work. Once replication starts, several regulatory methods ensure that other DNA polymerases are blocked, so that the cell does not immediately start a second round of replication. The Hda protein, shown here from PDB entry 3bos, plays a central role in this regulation by disrupting the DnaA protein complex. 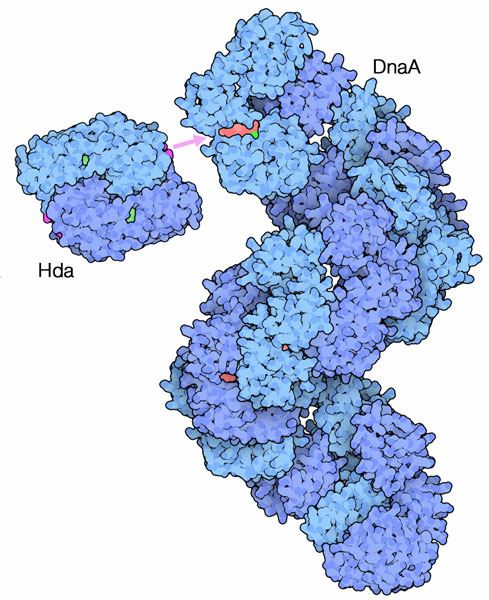 When Hda is activated by one of the components of the DNA polymerase (indicating that replication has already begun), it binds to DnaA and cleaves a bound ATP (shown here in red). This causes the DnaA complex to fall apart. The DnaA proteins must then replace their ATP and form a new complex on the DNA before replication can start again. It's important that cells only start replication once per generation, so that the daughter cells don't end up with extra copies of the genome. Bacterial cells, however, are very tricky and have figured out a way to divide faster than you would think was possible. For instance, an Escherichia coli cell typically requires about 40 minutes to replicate its DNA. However, in ideal environmental conditions, these same bacterial cells rapidly build new proteins, ribosomes and membranes and are seen to divide every 23 minutes. So how do they deal with their slow replication of DNA, since each new cell needs a copy? They do this by starting a new replication cycle each generation, even if the circle isn't completely copied yet. So, there may be several replication forks working on the DNA at any time, but only one completed cycle of replication each generation. The Hda protein is a member of the AAA+ family of proteins. AAA+ proteins use ATP to control diverse functions in assembly and force generation. These proteins typically contain two different functional groups: a form-fitting active site that binds to ATP, and an 'arginine finger' that is involved in the ATP cleavage event. Typically, these proteins associate to bring the arginine finger of one subunit close to the nucleotide-binding site of another subunit. In this way, subtle motions of the two subunits can control whether the arginine finger cleaves the ATP. In Hda, however, these two functionalities are separated. 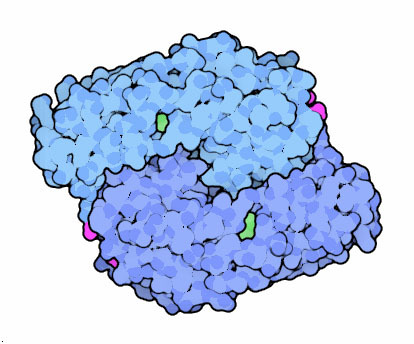 The nucleotide binding site, which actually contains CDP in this structure (shown in green), is part of a tight dimer interface, but the arginine fingers (in magenta) are on the outer surface of the protein, exposed and ready to attack the ATP in DnaA. Two catalytic residues from the arginine finger (arginine 161 and aspartate 157) are shown here. Xu, Q., McMullan, D., Abdubek, P., Astakhova, T., Carlton, D. Chen, C., Chiu, H.J., Clayton, T. Das, D. Deller, M. C., Duan, L., Elsliger, M. A., Feuerhelm, J., Hale, J., Han. G. W., Jaroszewski, L., Jin, K. K., Johnson, H. A., Klock, H. E., Knuth, M .W., Kozbial, P., Krishna, S. S., Kumar, A., Marciano, D., Miller, M. D., Morse, A. T., Nigoghossian, E., Nopakun, A., Okach, L., Oommachen, S., Paulsen, J., Puckett, C., Reyes, R., Rife, C. L., Sefcovic, N., Trame, C., van den Bedem, H., Weekes, D., Hodgson, K. O., Wooley, J., Deacon, A. M., Godzik, A., Lesley, S. A. and Wilson, I. A. (2009) A structural basis for the regulatory inactivation of DnaA. Journal of Molecular Biology 385, 368-380. Nielsen, O. and Lobner-Olesen, A. (2008) Once in a lifetime: strategies for preventing re-replication in prokaryotic and eukaryotic cells. EMBO Reports 9, 151-156. Erzberger, J. P., Mott, M. L. and Berger, J. M. (2006) Structural basis for ATP-dependent DnaA assembly and replication-origin remodeling. Nature Structural and Molecular Biology 13, 676-683. Neidhardt, F. C., Ingraham, J. L. and Schaechter, M. (1990) Physiology of the bacterial cell. Sinauer Associates, Sunderland MA.